Last night I, along with a half-dozen of your neighbors, attended the General Plan Circulation Element Workshop in the Emergency Operations Center (EOC). 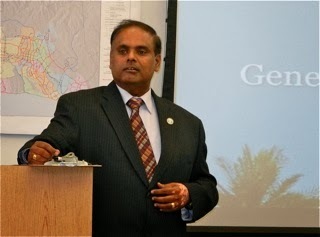 The meeting was sparsely-attended, with staff and consultants outnumbering the residents who took time from their busy lives to hear the presentation from Transportation Services Manager Raja Sethuraman and provide input into the General Plan Update process. 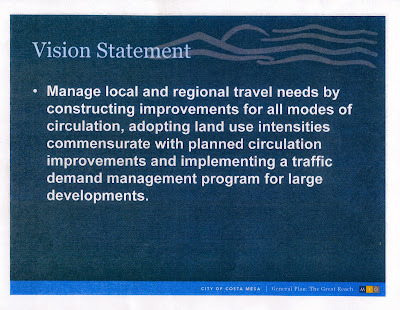 As part of his presentation Sethuraman provided us with drafts of two vision statements, below, onto which specific goals will be attached as the General Plan Update is fleshed out. He also gave us snippets of of information from the current General Plan, updated in 2000, to provide us with perspective. Those of us in the audience, most of whom had done their homework and came prepared to ask questions and give reasoned opinions, had the chance to do just that. 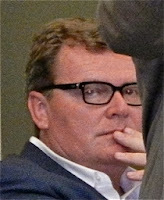 The meeting stretched until 8:00 p.m. and seemed to be a worthwhile effort. Sethuraman and Public Services Director Ernesto Munoz provided good information to us. As part of his presentation Sethuraman discussed the current status of the I-405 Enhancement Project, giving us basically the same presentation he gave the Planning Commission Monday. I wrote about that earlier, HERE. He encouraged us all to attend the Town Hall meeting in Westminster on October 29th. 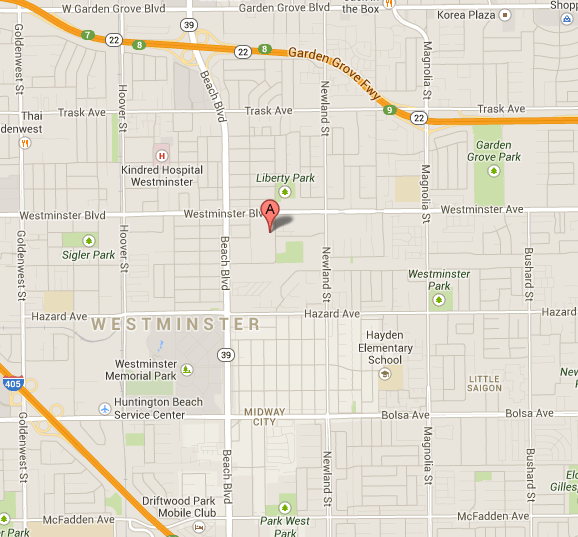 See that previous entry for directions and more information. Oh, yes - Mayor Pro Tem Steve Mensinger lumbered in about an hour into the meeting, plopped onto a chair along the wall and remained mute, tinkering with his cell phone for about forty-five minutes before walking out, apparently to take a call. He didn't return. NEXT UP - "PREFERRED ALTERNATIVES"
The next General Plan Update meeting will be the Preferred Alternatives Workshop and will be held at the same venue on Wednesday, November 20th, from 6:00 to 7:30 p.m.
***SPECIAL NOTE: 10:08 a.m. Wednesday - Due to technical issues the streaming video, and the clips I provided very early this morning, had to be adjusted by the city staff when they arrived today. The whole video is back up and I've adjusted the two clips below. Last night, as I sat in the Costa Mesa City Council chambers to observe my first council meeting since my much-needed vacation, I knew there would likely be some strained moments because of the subject of the only item on the agenda besides a couple presentations and the Consent Calendar. When the meeting began following a two-hour Closed Session during which labor negotiations and a law suit were discussed it seemed to me that the council was particularly somber. That feeling was borne-out by Mayor Jim Righeimer's adversarial, confrontational attitude that permeated the entire meeting. Sadly, it appeared that the only people in the room who heard and heeded that message were members of the public who rose to speak to the council. Righeimer certainly did not. Throughout the evening he treated speaker after speaker. 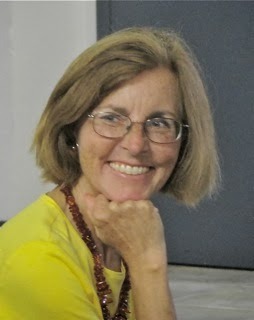 Resident Cindy Brenneman, a long time community activist, actually called him out on it from the speaker's podium. 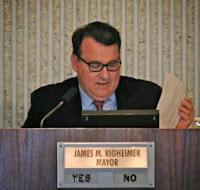 Although Righeimer played games with the schedule, splitting the Consent Calendar into two segments, all items on it were passed with virtually no discussion. Only resident Beth Refakes addressed an item separately - #12, the purchase of 435 new computers. It passed on a 5-0 vote after having been the subject of rancorous discussion the last time it appeared before the council. 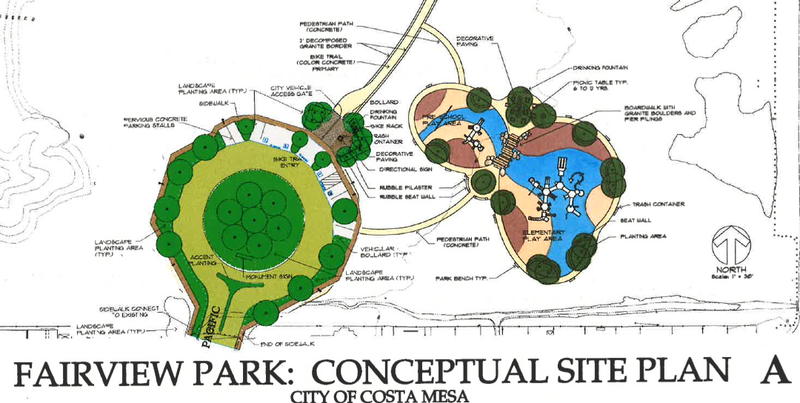 The major issue of the evening, of course, was councilwoman Sandra Genis' request for a re-hearing of the much-discussed Fairview Park Enhancement Project. You can read Bradley Zint's excellent coverage of this issue in the Daily Pilot HERE and Antonie Boessenkool's coverage in the Orange County Register, HERE, if you can get behind the paywall. You can also watch the streaming video of the meeting HERE. After Righeimer reminded everyone, several times, that the issue at hand was NEW, RELEVANT information that would affect a decision on a possible re-hearing at a future date, NOT a discussion of the value of Fairview Park, the sanctity of the Native American artifacts that might be there or whether their should be playing fields in the park. Despite that admonition, a few of the two dozen folks who rose to speak strayed from the assigned path and were either cut off by Righeimer or required to get back on the proper subject. For ninety minutes speaker after speaker stepped up, including many members of American Indian tribes, to urge a re-hearing. Genis pointed out several areas that included new information and several speakers reinforced her views with their own list of new issues. However, when Righeimer used the word "relevant" I knew the request was doomed. Relevance is in the eye of the beholder and, in this case, Righeimer was the only "beholder" that counted. 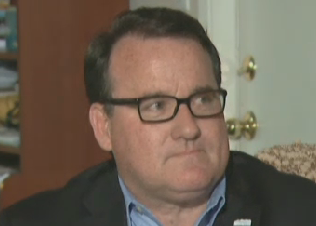 He had Steve Mensinger and Gary Monahan's votes from the outset. At the end Righeimer made a motion to deny the request for a re-hearing which was seconded by Gary Monahan. Take a couple moments to watch what happened at that point in the meeting. 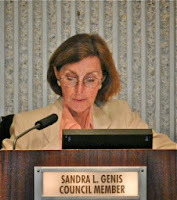 I have watched council proceedings for a long time and I've NEVER seen Sandra Genis so angry. The vote was taken on Genis' substitute motion and it, predictably, failed, 3-2 - the men voting against it. Righeimer then called for the original motion - to reject the request - and it passed on a similar vote. The crowd was very angry and raucous as it immediately left the auditorium, shouting out things like "See you in court". Clearly, last night demonstrated the continuing divide between the men and women on the dais. Genis, an experienced council member and former mayor with professional expertise in the governmental nuance of issues exactly like the Fairview Park issue, presented point after point that met the "newness" test and, in the view of many in the auditorium, also met the "relevance" test. Righeimer wasn't buying it because he didn't have to - he had the votes and knew it. In my opinion, the only way to bring harmony and stability back to our city is to defeat him at the polls next November. His performance last night may have been a good first step toward that goal. Every time he arrogantly disrespects another new segment of the community he loses votes. It's certainly well past time to send him packing. COIN TOSS - SHORT MEETING OR LONG? Tonight the Costa Mesa City Council will meet again for what, based on the agenda, HERE, should be a relatively short meeting. 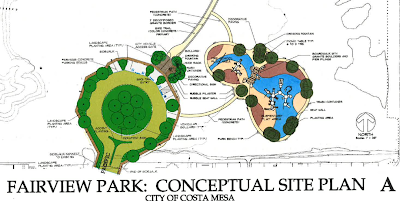 However, considering the single item on the agenda - Councilwoman Sandra Genis' request for a re-hearing of the now-controversial plans for the Fairview Park Entryway Plans - nothing will surprise me. The Consent Calendar brings us some interesting items tonight. Item #3, Warrant #2493, HERE, includes an entry for our contract law firm, Jones and Mayer, for $132,140.30 - again and amount that exceeds the annualized projected costs for their services. And, again, it includes an entry for the "Acosta Appeal", which seems like it is hanging on forever! This same warrant includes $11,862.00 to an outfit called Interwest Consulting Group,Inc., for "Professional Svcs - Jul 2013". Who are they and what kind of services did they provide? Item #4 is Warrant #2494, HERE, and includes an interesting entry to Cognify for $52, 274.33. You remember those guys, right? Their head honcho, Mace Wolf, is a contributor to Mayor Righeimer's campaign. I'm sure it's only a coincidence that we keep on paying this guy big bucks, right? 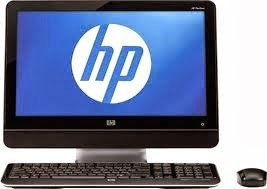 Item #12, HERE, is the return of the request for 435 new Desktop computers throughout the city. Once again, the staff - this time in the form of Costa Mesa Police Captain Les Gogerty - will attempt to convince the council of the pressing need for this equipment. And, once again, a grumpy old fella from Mesa North will tell them that they shouldn't buy them all at once. For an alleged Mensa member, he sure can be stupid sometimes. We hope the council has the wisdom to proceed with this critical purchase to keep our depleted staff more effective with contemporary productivity enhancing equipment. Item #13, HERE, is a similar issue. This one is for an essential upgrade to Broadband Service, again, to help the police and fire staff be more responsive and productive. This is especially critical now that the short-sighted council majority has caused a critical and on-going shortage in police staffing. Again, Captain Gogerty will lead this presentation. The staff report makes it crystal clear why this upgrade is so important. The final item - the only item - on the actual agenda is Genis' request for a rehearing of the Fairview Park Entryway Concept Plan, HERE. This one could be VERY interesting. I expect we'll hear from more than a few interested residents, maybe some dueling archaeologists and, perhaps, some Native Americans with a very real vested interest in how Fairview Park is managed. I have no idea if members of the federal government will show up - probably not, since they're on furlough. As I understand it, tonight is just Genis' attempt to convince the remainder of the council that they need to re-hear the item. It won't be re-heard tonight, but the public can certainly weigh-in on the issue. If the re-hearing is granted it will likely come sometime in November - maybe the first meeting. Regardless, a lot has happened since this item was last formally discussed from the dais. It will be interesting, indeed. This one could be a short meeting or another long one. As it is, the council begins their day with a very early closed session - 4:00 p.m instead of the normal 5:00. There are two items on that segment of the agenda - a conference with CEO Tom Hatch on negotiations with the Costa Mesa City Employee Association, Costa Mesa Division Managers Association and the Costa Mesa Fire Fighters Management Association. 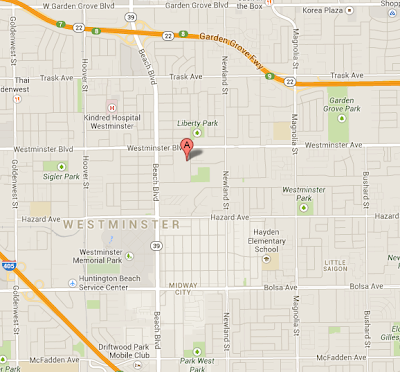 The second one involves existing litigation between the Costa Mesa Employees Association and The City. Last nights Costa Mesa Planning Commission meeting, which probably could have, and should have, been completed in a couple hours managed to stretch to double that length. Upon reflection, at least 30 minutes of that time could have been saved if Chairman Jim Fitzpatrick didn't like to hear himself talk - and say not much of anything. Then, again, maybe the commissioners were feeling guilty about being overpaid based on their peers around the county, so wanted to "earn their keep"by yammering on and on. You can read the agenda HERE and watch the streaming video HERE. Perhaps the most important issue discussed last night was Transportation Services Manager Raja Sethuraman's report to the commission on the status of the I-405 Improvement Project. 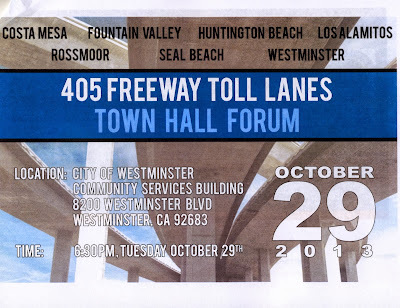 You remember that one from last year, when the city and adjoining neighboring cities apparently successfully fought off the scheme to widen the I-405 as it passes through Costa Mesa and add High Occupancy Toll (HOT) lanes, replacing the High Occupancy Vehicle (HOV) lanes - the "carpool lanes" we know and love. Well, the Orange County Transportation Authority (OCTA) and the California Department of Transportation (CalTrans) have just not let this thing go and are back with a newer scheme - one just as onerous as the previous one - that would likely again include the destruction and replacement of the relatively new - 4 years? - Fairview Bridge over the I-405 to accommodate additional lanes. You can read about the project status HERE and a long, comprehensive OCTA staff report HERE. However, all you really need to know is this sentence, contained at the bottom of page 4 of that second report. It reads thus: If an ascending debt structure is used, the toll revenue stream could generate up to $186.6 million in toll financing capacity. Yep, folks, it's all about the money. Apparently CalTrans has put the old squeeze on the OCTA and threatened to convert whichever choice they make into the HOT model - and take the resultant revenue for use elsewhere in the state. So, the OCTA folks are now scrambling to produce a revenue-generator that will keep the toll fees in Orange County - and not necessarily to be used in the area in which they have been collected. Several other toll roads are in dire financial straits, so funds from "our" segment of the I-405 may be used to help pay the debt on those roads. 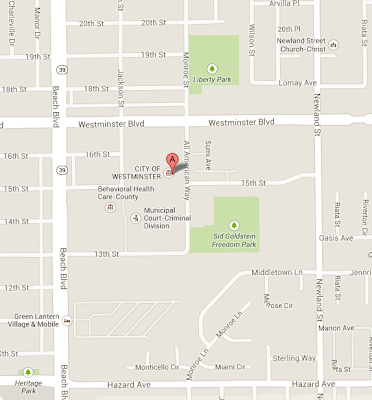 All of which is saying that we need to have a very significant presence at a Town Hall being held by the OCTA seven corridor cities most dramatically impacted by this plan at 6:30 p.m. in the City of Westminster Community Services Building, 8200 Westminster Blvd. We need to let our voices be heard and try to keep the Fairview Bridge from being replaced and the toll portion of this scheme from reaching its tentacles into the heart of Costa Mesa. The bottleneck begins beyond the border of Costa Mesa, north of the Santa Ana River, and that's where the "fix" should begin. Here's the flyer on the meeting. 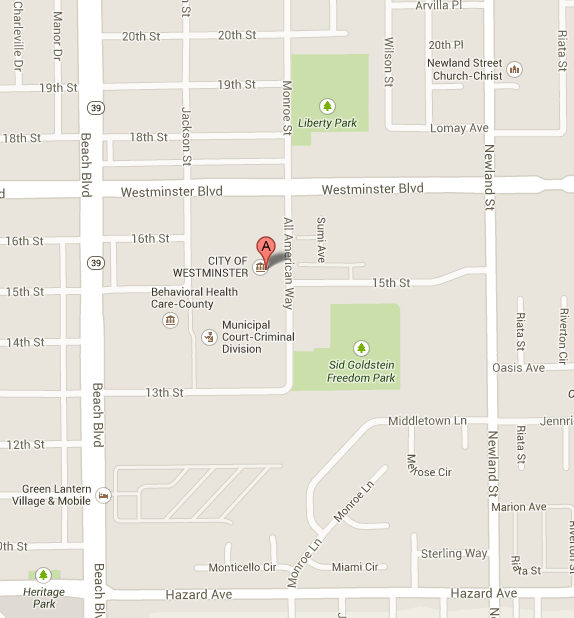 And a couple maps to help you find the venue on the 29th. There were other items on the agenda last night, too. Fitzpatrick, apparently trying to save a few bucks by not keeping our contract attorneys sitting around, scrambled the agenda and heard the last item, New Business #1, first, then Public Hearing #3, then went back to the published order. New Business #1 is the discussion of what is known as "Residential Neighborhood Enhancement Program Number Four", a focused attempt to "clean up" a specific part of town by applying code enforcement muscle to force property owners to shape up. The area covered is shown in this image. After a 10 minute discussion the Commission authorized the staff to move ahead with this program. Public Hearing #3 is a change in the Municipal Code "tightening up" the language that defines a "single housekeeping unit". Apparently the City lost some money in a lawsuit recently because the judge didn't like our language, so was an attempt to amend the code to fix that problem. 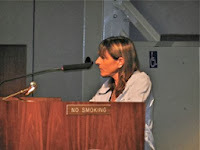 More than forty (40) people attended to hear this issue, including one fellow named Paul Dumont, who described himself as a Los Angeles Housing Rights Activist. He attempted to put the fear of God - and the legal system - into the commissioners, implying that HUD funding was in jeopardy if they proceeded with this plan, and that lawyers from all over the country were flying in to sue the pants off the city. Gee, what's new? Apparently he, and most of those in the audience who came to hear this issue, thought this was aimed directly at the growing number of group homes - drug and alcohol rehabilitation sites - that have begun infesting residential neighborhoods in our city with noise, migrating smoke in the neighborhoods and parking problems. Dumont was among the half-dozen speakers on this issue - most of them were new faces in council chambers - and most were in favor of making the proposed change to the code. After nearly an hour of discussion - and vacillation by Fitzpatrick, who wanted the staff to prepare a more "robust" staff report, whatever that means, the commission voted, 3-2 to approve the current staff recommendation and send it to the City Council on the November 5th meeting. Public Hearing #1, authorizing the valet parking that's been done at a medical office building on Nutmeg Place, was given a short discussion, then approved by the commission. 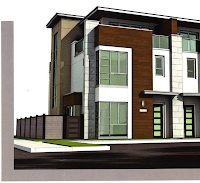 At 7:45 the commission began the discussion on Public Hearing #2, the proposed 10-unit condominium development on Bernard Street. This project generated a lot of public comments - a half dozen folks rose to criticize the project, including one man who will be displaced from his home of many years. 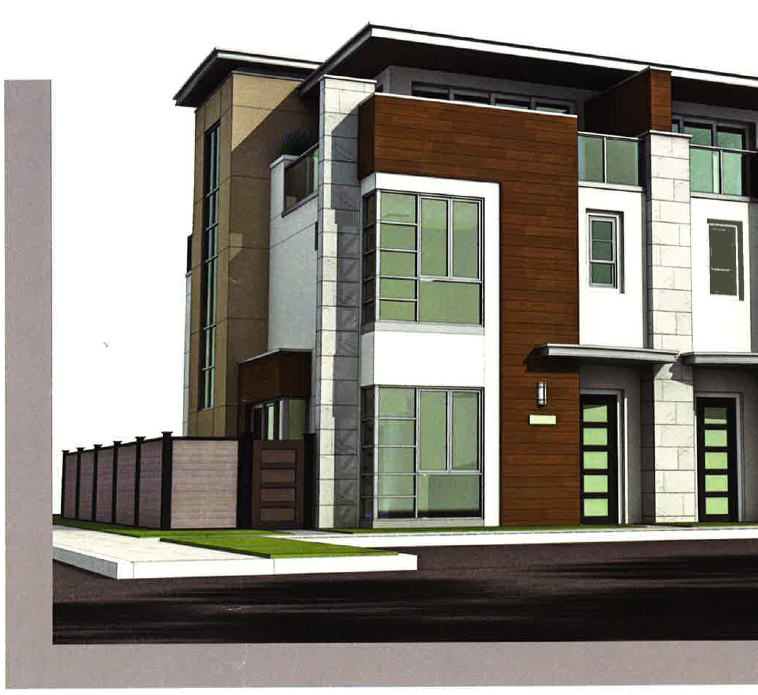 There was conversation of the units being "affordable", but the developer says their target price is in the $600,000 range. We live in the land of curious definitions. The commission approved the project with its numerous conditions of approval on a 5-0 vote. Finally, shortly after 9:00 p.m., the commission tackled the remaining item on the agenda - the change in the Municipal Code to dramatically impact the so-called "Hookah Parlors" in our city. Apparently there are three operating legally and one not-so-legally. Of those, one on 19th Street apparently has been a significant problem from a law enforcement calls-for-service standpoint. Representatives of two "parlors" extolled their virtues, described how they are cultural activities in certain communities - the Armenian community, for example. Representatives from the American Cancer Society and the American Lung Association spoke against the concept of a place where the concentration of smoke and cancer-causing contaminants us found. Eventually, after nearly an hour of conversation about whether to out-right ban hookah parlors or to place a moratorium on any future such establishments while the staff and commission studies the impact on them and similar places - cigar lounges and the new electronic cigarette venues - they voted, 4-1, with Colin McCarthy voting NO, to reject the staff recommendation and recommend to the City Council to establish a moritorium. We left at 10:00 p.m.! 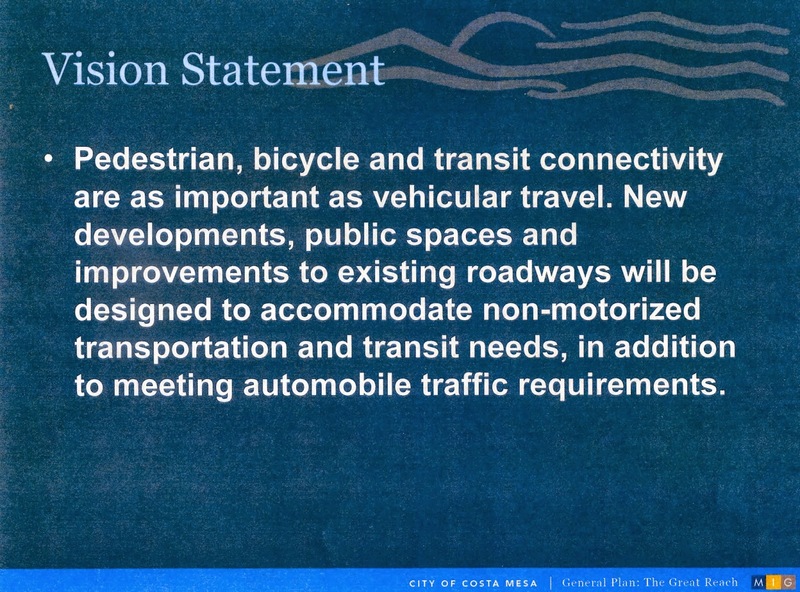 The overpaid Costa Mesa Planning Commission will meet once again this evening for yet another skimpy agenda. I said "overpaid" because these guys earn more than double most other similar municipal bodies based on the most recent survey done and, more than a little ironically, some of them are among the most vocal about employee pay and benefits. Anyhow, tonight they will receive yet another Code Enforcement Update, HERE, that tells you which of your neighbors have been slackers when it comes to keeping up their properties, which ones have been slapped with fines and which ones have cleaned up their operations. It makes for interesting reading. There are four (4) Public Hearings on the agenda tonight. The first one, HERE, requests a conditional use permit to authorize an existing valet parking service that is already provided to customers at the location - a medical office building on Nutmeg Lane. A review of the staff report shows nothing particularly controversial, so I expect it will be approved. The third Public Hearing is a change in the municipal code to tighten-up the definition of a "single housekeeping unit", HERE. This was prompted by a lawsuit filed against the city which it lost involving a residence with more than double the approved number of occupants. Theoretically, this change will make it possible to more adequately regulate "group homes" with six or fewer residents. The final Public Hearing, HERE, is a change in the Municipal Code to tighten up the requirements for so-called "Hookah Parlors", making it more difficult for them to open throughout the city. The final item on the agenda, New Business #1, HERE, deals with Residential Neighborhood Enhancement Program Number Four, which basically covers the area shown in the photo below. Apparently, the purpose of this agenda item is to receive input from the property owners involved and for the commission to direct staff to initiate the program for the neighborhood. This morning I planned to ease back into discussions of Costa Mesa issues that happened while I was on my little vacation, but the rising sun brought news that flung me back into the saddle a little more abruptly than I anticipated. 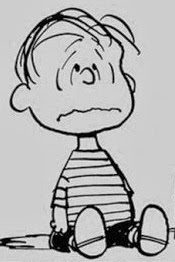 According to news this morning, yesterday Governor Jerry Brown signed Senate Bill 7 into law and most likely sent hundreds of local politicians into a collective frenzy. Certainly some of our local elected leaders will begin frothing on this issue as soon as they finish their granola this morning. SB7 - a bi-partisan bill co-authored by by Senate Pro Tem Darrell Steinberg (D- Sacramento) and Senator Anthony Cannella (R- Ceres), limits charter cities authority on the use of prevailing wage by imposing financial penalties on them. Capitol Week announcing the signing today, HERE. California League of Cities view, HERE. *This is from Public CEO this morning, HERE. A couple things are certain. In short order this morning we will likely hear from Mayor Jim Righeimer on this issue, either as a solitary observer or as a member of a panel of elected officials decrying its passage. 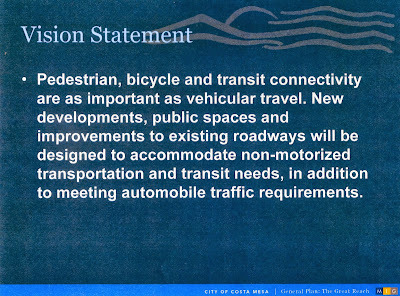 And, the Costa Mesa Charter Committee will now have to revisit the hard-fought language they finally agreed upon at their last meeting that would have precluded Costa Mesa from being bound by the prevailing wage rules. This is no small development, since Righeimer made the prevailing wage issue the cornerstone of his failed Charter attempt last year and, through his surrogates on the current committee, this effort, as well. 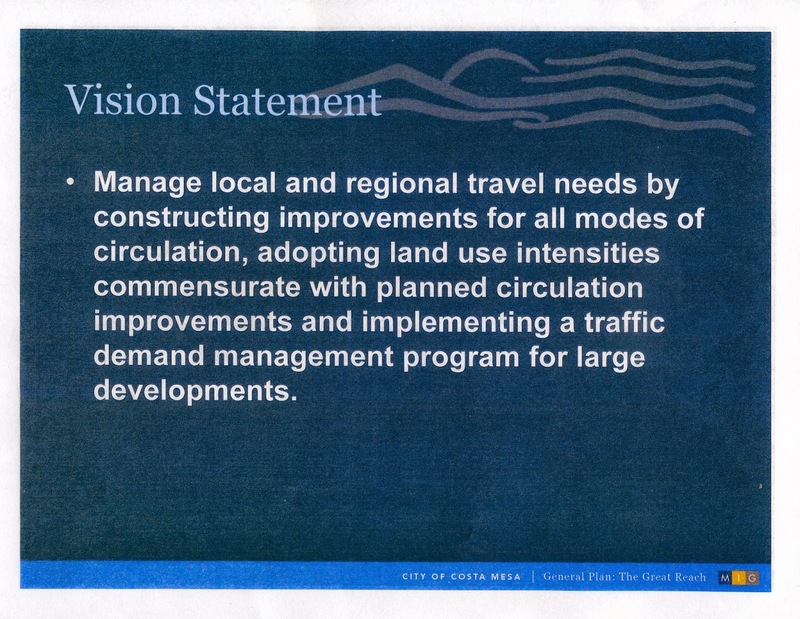 All along his mantra has been that Costa Mesa should be a Charter City to save "millions" on projects. The passage of SB 7 kicks that argument squarely in the teeth. Without the prevailing wage issue on which to build a new Charter scheme it's likely the voters will - AGAIN - find little to attract them to changing the foundational form of government in this city. This battle is probably not over yet. Through many of the opinions found via a Google search it's clear that some factions seem poised to challenge the constitutionality of SB 7. We'll see.